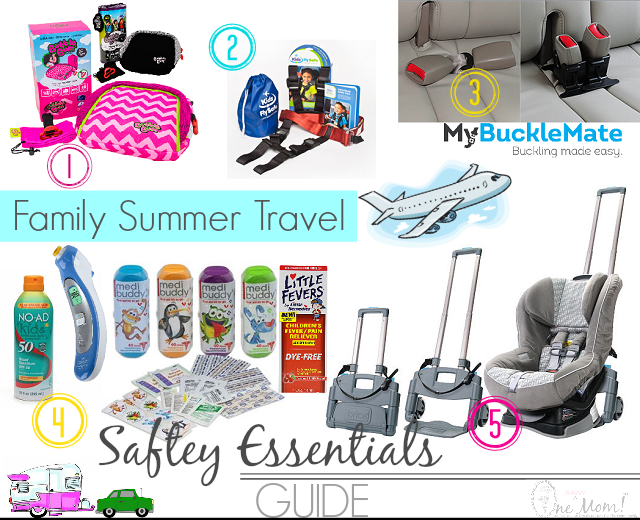 Whether your taking to the friendly skies this summer, or your headed out on an epic road-trip with the family, get there safe! If you have young children, don't leave home this Summer without the essentials. A Stash of Essentials: Pack a bag or container that includes; sun screen (for the kids and adults), a small first aid kit (we love the mom-invented MediBuddy kits), a thermometer, and pain reliever/fever reducer. You just never know what might come up when your away from home, and it's always better to be prepared! Brica Roll n' Go Carseat Transporter: Traveling with infants/toddlers can be difficult. Lugging the car seat through the airport really isn't anyone's idea of a good time but, it's necessary. The Brica Roll n' Go Carseat Transporter makes it easier to transport your little one AND their carseat through the airport, by turning your carseat into a stroller (supports up to 60 lbs.). The push button wheels on the Brica Roll n' Go fold flat making it a cinch to store in overhead compartments too! The Brica Roll n' Go Carseat Transporter retails for $79.99 and can be found at select retailers nationwide. Where are you headed this summer? Wherever you're travels take you, we're wishing you an amazing safe season, filled with quality time with the ones you love! **// Disclosure: Media samples were provided. All opinions expressed are our own.